Located in Pangalo Island, Eskaya Beach Resort and Spa is a haven for those seeking ultimate relaxation during their stay here in the island of Bohol. It is a perfect hideaway from the distractions of the city. The sprawling property sits on 16 hectares covered in lush tropical garden. The view is fantastic as it shows a long stretch of white sand on this side of Panglao facing Bohol Sea. The beach on this part of the island is a total of 5 kilometers and 600 meters of it belong to Eskaya. There is a variety of land formations around the area, a gradually ascending cliff, flat land, a ravine and caves. The name “eskaya” is the only known indigenous people of Bohol. The place is serene and very tranquil. The architecture that is common around is a true Filipino style with modern amenities. The exotic thatched villas that are called “balai” are built with sturdy construction and materials used are locally found in the island, like the bamboo, cogon and native wood. The villas also have their own swimming pools. The infinity pool is amazing and blends with the view of the sea at its bluest color. The villa’s bathrooms have a whirlpool bath and a rain shower. The shower is set outdoor and separated only by bamboo fences for privacy. The beds are huge and comfortable and the pretty mosquito net around the bed makes you feel like royalty. Different dining set ups can be requested. You can dine under the moon and the stars, or al fresco, by the poolside or by the beach, or simply enjoy the warm ambiance of their restaurant Lantawan. They can also set up a bonfire and barbecue at the beach for casual dining. Breakfast can also be requested to be set up in the garden in the midst of beautiful birds chirping and flying by. Or in-villa setting can also be arranged for a more private and intimate dining. The staff is efficient, very friendly and super attentive. It is fast and superb service and the room service is very quick. It is like getting the contentment and convenience at your own home but with the beautiful and serene surrounding to greet you. The resort can also arrange other activities like island hopping, sunset cruises, cruising at Loboc River, visit the man-made forest, Chocolate Hills or go scuba diving in Balicasag Island or go whale-watching at Pamilacan Island. The Handuraw Spa in Eskaya is tranquil and modern. It offers a gracious fusion of traditional therapies and modern spa technology, a melting pot of Asian healing practices and rich European spa traditions. The experience of staying at Eskaya is definitely unforgettable. Treat yourself and book with us and stay at this marvelous place in Panglao Island in Bohol. You can also click the name of the hotel in our Quick Hotel Finder button to easily jump to the resort’s page. A little advance planning definitely helps you make the most of your time and money in Bohol, Philippines. Research about the places you want to see and activities you want to do. Do read reviews, but do not dwell in them too much as your expectations might be set too high. Our website has a lot of good suggestions and is well worth it to check out. Do not overdo your itinerary and just leave yourself just rummaging through a crowded traffic of tourists or your basic inability to relax leaving you only with 5 hours of sleep each night. Make a back-up itinerary in case the one you have is not working out for you. Most importantly, learn how to say no to extra load from work while you are away. It is your vacation and you must enjoy it without having to be stressed out for the same reason you are on holidays to un-stress yourself. It is also best to spend more time exploring fewer destinations, thereby creating a more intimate travel experience. The good thing is that despite all of its variety, Bohol is considerably a tiny place and it’s relatively easy to explore within half a day or less. You can easily enjoy all of the island’s main fields of interest: beach, jungle or land activities and hopping to other islands in a week. Hire a guide. The idea that hiring a guide is for amateur tourists is really a misconception. Hiring a guide could be the best move you make. Especially it’s a good idea if you are going to be in a place for a short period of time. Be always polite, an aggravation due to an ugly exchange brought about by a little misunderstanding will totally fall under how to ruin your vacation. Only over the Christmas-New Year’s, Chinese New Year’s and Easter holiday periods might you face any difficulties in finding a room, but it still pays to book ahead for any particular places you’re keen to stay in, and make inquiries about the necessity of booking for any activities, such as diving and dive courses. Bohol is budget travelers’ paradise and there are accommodations for every range. The best months to visit Bohol are the drier ones: November through June, the Amihan season. The rainy season, which is the Habagat Season (July to October) isn’t so wet that you can’t do anything fun. However, there would be sporadic days in a week in the Habagat Season that it just rains heavily. The biggest tourist influx is in the couple of weeks each side of Christmas and Easter. Many accommodations, especially the more expensive ones have high and low-season prices. Please check the season specified on each Bohol hotel’s Rooms and Prices page when you book. There is also an ‘extra’ season referred to as Super Peak which is covering the Christmas, New Year’s, Chinese New Year’s and Easter periods, when prices go above normal high-season rates. If you’re using top-end or some mid-range accommodations, you’ll certainly save money by avoiding these seasons. See our hotel quick finder to see more about range in accommodations. Though a poor country, Philippines is at least as expensive as any other South East Asian countries. High taxes, many imports and the fact that much of its tourism industry is geared to Europeans on fairly short vacations help keep the prices a bit high. For US $70 to US $150 will buy you a solidly comfortable midrange double all throughout the island. For anything above the ordinary you’re often looking at a minimum of US $200, and the top end of the market goes above US $350. A good two- or three-course meal with a couple of drinks in a pleasant restaurant will average US $75 to US $150 (more if you eat lobster!). Furthermore, there are a lot of local cuisines that are worth the adventure at a considerable price. Budget travelers can make their money last longer by hanging out in local places. Travelling by jeepney is cheap, but car hire, taxis, boats and hotel transfers are not. Tours and excursions mostly run from $70 to $150 per person for a day (more for diving trips). Overall, a comfortable midrange budget per person is US $350 to US $450 per day. Staying in some of the better accommodations, enjoying plenty of tours and activities, and traveling by rented car or hotel can easily add up to US $600 a day could be more. Budget travelers might get away with US $75 a day if they’re particularly frugal, but you need to spend more like US $150 to US $250 to enjoy yourself. The simplest way to cut costs is to share rooms, transport and tours with other people. Philippine currency is the Peso (Php), which was hovered at or around a rate of Php 43 = US $1 for several years, prices in our website is converted with the current exchange each day. The accommodation prices on our website do not have any other additional rates, what you see is what you get. However, you might find in restaurants will have additional service charges, so do watch out for signs or ask accordingly. Cabilao Island is one of the smaller islands that surround the main island of Bohol, Philippines. It is located on the west side of Bohol Island, basically facing Cebu Island. It is a 7.2 Sq. Km. triangle of an island and can be toured in one day. The boat trip from pier of Mocpoc to Cabilao Island is close to an hour. Take a bus to Tagbilaran City, and then take a jeepney to the small pier. A small boat trip will give you a chance to see nice views of the curious overhanging rock formations of Cabilao’s coastline. This island only has 3,500 in habitants only with fishing, herding goats and raising chickens as their livelihood. Since this little island is a bit far off from the mainland, the peace and tranquility has been reserved. The only motorized transport is either a tricycle or “habal-habal” motorcycles that will bring you around for a small fee, or just reach areas on foot. The lack of roads also means that every supply is brought in via banka boats. During drought season, even fresh water for drinking and bathing is brought in via these boats, too. Since the island is not connected to the main grid, there is ration of electricity. The electricity is provided from 7:30AM to 11:30PM by a generator in Talisay Village (one of the 5 little villages in Cabilao). In the center of the island, a solar powered internet café is located. It is amazing how the modern technology has touched this remote place. This has been an initiative project by The Center for Industrial Technology and Enterprise, Cebu and the German Development Service. This little internet café is intended for locals to be connected to the internet. Cabilao Island is one of the international favorites for diving destinations. The main attraction is at its western tip, the town of Pantudlan. Here, there is a lovely lighthouse and a keeper’s cottage along a magnificent stretch of white sand shore. 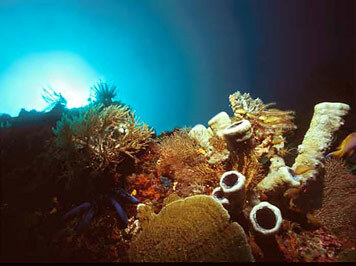 And most of all, Cabilao has many undisturbed reefs that made it a diving paradise. There are 3 resorts that specifically cater to divers, complete with equipment, including gears for snorkeling. The diving area around Cabilao is ideal for wall diving with great chances to spot many pellagics like Barracudas, Dogtooth Tunas and Giant Trevallies. If you plan to stay in one of the resorts, plan a night dive for great underwater macro photography opportunities. From December to June, there is a great chance to spot a school of Hammerhead Sharks. The best time to spot them is just after sunrise of just before sunset. There is also a bird sanctuary around Patudlan. It is a half-hour stroll from the resorts. You will follow a natural lake that will lead you to nipa-covered huts set up for observation. This island is so serene and with fewer inhabitants, flocks of birds are seen more than you would in Bohol Island. 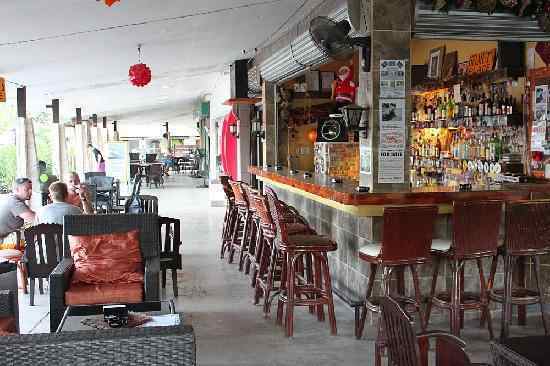 Helmut’s Place is a bar and restaurant in Panglao, Bohol. 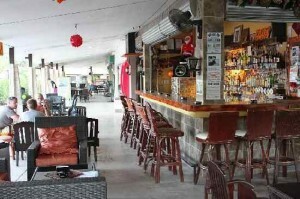 It is owned by Helmut Nauels and is located on the corner entrance to Alona Beach. It is a German owned establishment with a talented German chef, Oliver. The atmosphere is relaxed and the servers are young girls who are always ready to take your order with a smile. They serve German dishes well, although, they serve a good list of different international dishes. The serving is uncommonly huge for Filipino standard. Helmut’s Place only uses fresh and high quality ingredients. They play music from different decades and they stay open as late as 2 AM. You can also request your own favorite music if you wish. It is a likely hangout by locals and bikers, as Helmut, the owner is a member of Bohol Bikers Philippines. You can get to Helmut’s Place bar and restaurant by tricycle or Taxi cab and if you are a large party, you can hire a van to get there. The friendly atmosphere will surely make you keep going back night after night given you have a longer stay in Panglao, Bohol. Helmut has a magnetic personality and never lacks time to meet and greet everybody and thank everybody on their way out. There are bar stools by the bar and there are sofas and little tables set up like in a coffee house. You will definitely feel at home. 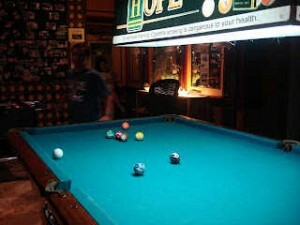 They have a pool table and foosball table, too. Live football games and Formula 1 races are played on flat screen on demand. Free Wi-Fi is also available for customers. Try their homemade Bratwurst, or their German-style Curry Sausage and their Cordon Bleu served with Potato Salad. They only serve San Miguel beers, although one would assume they will have German beers, too. However, if you like hard drinks, they mix very good cocktails and always a strong Rum and Coke. Not all the places in Bohol are always open late and a tour guide once claims it’s because Boholanos are frugal and that is why they sleep early. However, I think in most provinces around the Philippines most families retire really early to bed because their day starts very early in the morning. This place is definitely open late and guarantees to have snacks, too. Helmut’s Place also has been dubbed to have the cleanest and most functional rest rooms in all of Alona. You will definitely enjoy the friendly atmosphere and the young attentive all-Filipina staff is not so bad either. Additional convenience is that there is a BPI ATM next door and Helmut’s Place accepts major credit cards. Many different kinds of customers from all walks of life and from different nations have been very satisfied overall. I highly recommend Helmut’s Place for those who are seeking good food, good conversations and definitely good service. Mabuhay! Welcome to Bohol, Philippines! Bohol Island is the tenth largest island in the Philippines and is one of the popular destinations of many tourists from different parts of the world. It has 75 minor surrounding islands and is a neighbor of Cebu Island in the Central Visayas region. It is a tropical haven of natural beauty and home to many amazing diving and snorkeling sites. It is dominated by hills and plateaus and consisting of dormant and active volcanoes. 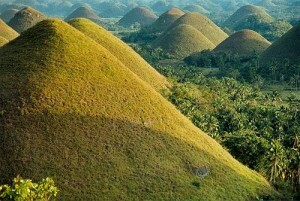 This is where the world famous Chocolate Hills, one of the natural wonders of the worldcan be found. Also, Bohol is home to many rare and endangered species of flora and fauna, one of which is the famous tarsier (Tarsiussyrichta), one of the world’s smallest primates. The seas surrounding Bohol and the second largest island, Panglao, is known for some of the world’s richest marine life, while Balicasag Island is famous for its endangered whales and dolphins that have attracted tourists for sightseeing tours. 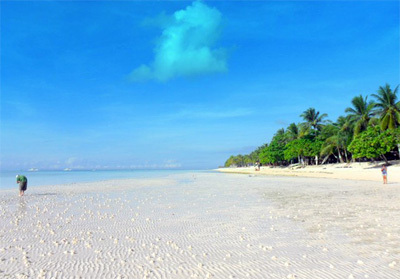 White sand beaches are common in the coastlines of Bohol, particularly in Panglao Island, where popular beach resorts are located. The weather is generally hot and humid and temperature stays at 25-32 degrees Celsius (78-90 degrees Fahrenheit) all year round. The temperature goes up to 28-38 degrees Celsius during the summer that starts from April and ends in June. Amihan Season (High Season) where the wind, usually hot and humid goes northeasterly to easterly with little to no rainfall starts from September to May. Habagat Season (Low Season) where the cool wind goes south-westerly with moderate to heavy rainfall starts from May to September. Amihan or Habagat can start a month later sometimes, so it would be October to June for Amihan and vice versa for Habagat. The nearest international airport is located in Mactan Island, Lapu-lapu City (part of Cebu). It is less congested than Ninoy Aquino International Airport in Manila. Numerous direct flights to and from Korea, Singapore, Hong Kong and scheduled flights to Japan, Qatar, Malaysia, Taiwan and China can be booked. Additionally, seasonal chartered flights can be booked to and from countries such as, Russia, China, United States and other nations. Visitors from North America, Europe and the Middle East would need a lay-over on the South East Asian countries listed above to get to Mactan International Airport.You will need to ride a taxi cab to Pier 4, price is about PHP 200 and from there you will then need to take a fast catamaran ferry (fastcraft) to Tagbilaran City seaport. This is usually takes an hour and a half, and costs more or less PHP 500 each way. Supercat and Oceanjet are some of the operators of fastcraft trips to Bohol. Please note that the airport terminal fee for international entry is PhP 700 per passenger and PhP 200 per passenger for domestic. There are different modes of transportation you can use around the city, but most tourists opt for taxi cabs. Make sure that you ask for a metered rate especially if you do not know your way around the city. If you are confident to have a little adventure, try the colorful jeepneys. There is no tourist information center at every corner so it is advisable to ask your hotel’s front desk on which jeepney routes to take to your destination before embarking outside rather than asking random strangers, although, sometimes it helps to ask. Most Boholanos can speak and understand English, so that would be a common language that can guarantee to get your message across. Make sure that you always have smaller denominations of the Philippine peso (PhP), as cabbies always most of the time say they don’t have a change for PhP 500 bill, and unfortunately can force you to just let them to keep the change. The Philippine Peso come in 1 PhP coin, 5 PhP coin, 10 PhP coin, 20 PhP bill, 50 PhP bill, 100 hP bill, 200 PhP bill, 500 PhP bill and the biggest, 1,000 PhP bill. There are tons of ATM machines around the city, but safest to use the known banks such as BPI, Metrobank, RCBC, BDO and some foreign banks like HSBC and Citibank. These banks are also the safest and cheaper way to get your money changed. However, it is important to get your money changed before getting out of the airport for your transportation fares. If you are a frequent traveler, you would know that additional fees apply for overseas bank transactions and sometimes your bank from your country might need to be pre-alerted that you are travelling to the Philippines so they can release money to you when you use the ATM machines here. Western Unions are available in many locations in Cebu City for money transfer transactions, too. Please don’t forget to bring your passport I.D., as they will not accept other forms of identification except your passport if you are a foreigner. While in Bohol, it is not customary to include a tip, but it would be nice if you can leave at least 10% tip for good service. However, some restaurants already include service charge on your bill so make sure to read your bill carefully before leaving money behind. As a matter of fact, if there is no clear signage in visible areas or a note on the menu that a service charge is included it would not be rude to ask if that is automatically charged to your bill prior to ordering rather than be forced to pay a service charge if you don’t want to. To visit the neighboring islands that have all the beautiful beaches like Balicasag and Pamilacan Islands, or other nature sight-seeing activities like in Danao for Extreme Adventure Tour and maybe visit Hinagdanan Cave in Dauis, you can rent a car or take a cab to the nearest port to where a boat will bring you to which island. Renting a car usually means that you will have a driver to bring you to your destination and back if you prefer, although, the usual rent-a-car concept where you will drive the car yourself is also available. The Philippines is a third-world country, but is a very forward country in terms of communication and data and not so lagging behind with the bigger industrialized nations of the developed world. In fact, as far as cellphone use is concerned, this country is definitely in the industry’s front. The Philippines is the texting capital of the world. Texting has boomed here long before it was popular in the US and numerous mobile phone applications are invented here. Grab any SIM card from any of the local 3G or 4G networks like SMART, GLOBE or SUN and just get electronic loads for usage credit. Local phone calls are PhP 7 – PhP 10 per minute and SMS texts are PhP 1- PhP 2 each. There are numerous load stands or you can buy phone cards for load that come in PhP 100 or PhP 300 usually, this is best and cheaper way to connect between families visiting together instead of accumulating expensive international roaming charges. You can ask your hotel desks as they may have electronic loads available for purchasing. Please note that the metric system is used in most trade and legal transactions and standard electricity is 220 Volts A/C, although 110 Volts A/C is also used especially in major hotels. Also, most large stores, restaurants, hotels and resorts accept major credit cards including American Express, Visas and MasterCard. Traveler’s checks preferably American Express is accepted at hotels and large department stores. Personal checks drawn on foreign banks are generally not accepted. As with any trip, you should take standard safety precautions. Don’t leave your belongings unattended, avoid flashing wads of cash, and don’t wear or carry jewelry. If you can get a safety deposit box in your hotel, it is advisable to leave your precious personal effects and important documents behind. Bohol is a safe place, but it would not hurt to be aware at all times. I hope you enjoy your stay and take as many pictures you like to post on your Facebook page. Visit our General Information page for more detailed information and feel free to look at the other blogs about tourist destinations here in Bohol. You have tried the jeepney and the tricycle in getting around Bohol, how about getting by bridge, The Hanging Bridge, that is? It connects two barangays in Sevilla, Bohol a town north of municipality of Loboc. These two barangays are separated by the Sipatan River which also connects to the Loboc River. The Hanging Bridge is laid over 20 to 25 meters high above and spans 40 meters long of woven bamboo slats with steel cable wires as hand rails. There used to be just one bridge and recently and an additional one is built to efficiently separate ongoing and outgoing foot traffic. Before steel wires were made into hand rails, the locals had used ropes before. So you can actually imagine the thrill it has made for tourists, but safety is priority that is why steel cable wires are integrated into the design, as obviously is added for stability. The bridge tends to sway forward and backward and swings sideways too. It is advisable to hold steadfastly so you don’t get thrown off. Some parts of the bamboo slats might appear broken, but definitely sturdy enough to step on. If you have children with you, must wait until the traffic clears a little bit as the bridge swings even further out if it carries multiple passers-by. Please do use your own sound judgment on this. There is a small fee that locals ask for, so they can use the collected money for maintenance of the bridges. This short tour is normally overlooked because it is a bit off the way from the usual Bohol trips. It could be requested or just choose a tour that already include swinging by the Hanging Bridge, no pun intended. It is a quick dose of excitement for the day, but the view of the emerald Sipatan River from the bridge is worth it. At one end of the bridge there are little souvenir shops, snacks and beverages shops, too. Furthermore, you can get your fresh Buko (coconut) juice fix here to quench your thirst after that thrilling trip (or maybe not). 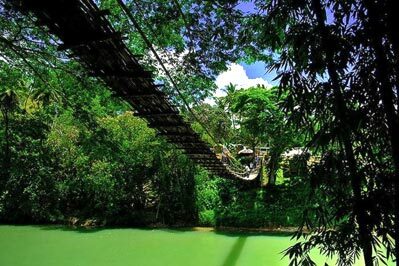 Enjoy a day of fun and a little excitement at The Hanging Bridge in Sevilla, Bohol. Don’t forget your camera. Mag-aso Falls is one of the natural treasures of Bohol, Philippines. Behold for yourself the magnificent twin falls, often obscured by fine mist that appears smoke-like. Thus, Mag-aso falls got its name. “Aso”, in the local dialect means “smoke”. With a height of 25 feet, the twin falls is picturesque against a backdrop of tall trees, wild plants including giant ferns, and deep ravines. It is located 20 Km from Tabilaran City in the town of Antequera and roughly a half an hour ride away. Antequera is an inland town located in the western part of Bohol, Philippines and consists of 21 Barangays (district). Aside from being blessed with rolling & rugged terrains interspersed with rivers, streams and brooks, the town is also known as the basket capital of Bohol, Philippines. Sundays, Antequera’s market day, is the day when baskets of different sizes and shapes are displayed in the local market and traders from out of town, hailing from Cebu and far-off Manila come to buy their products for export to other countries throughout the world. The town may be so out of the way, yet travelers who make the trip find it worthwhile. Intermittent verdant rice fields with hilly backdrops are stunning to look at aside from the picturesque ancestral homes that dot the way. Mag-aso Falls is one of the main attractions of Bohol, Philippines but rarely included in day tour itineraries since it is relatively out of the way. Situated inland, it does not lie in the pathway towards Loboc town, the Loboc river cruise, tarsier viewing, and on towards Bilar’s mahogany man-made forest and the Chocolate Hills, Bohol’s main attraction. In Mag-aso Falls there are approximately 197 steps with metal guardrails which direct towards the scenery. There are seats made up of stones where one can take a rest after the long travel down to the falls. Trekkers, who love a rough and challenging terrain can avoid the steps, enjoy a slippery descent and do an exhilarating climb with the use of shrubs and stones as foothold and vines and other plants to pull one up. But rainy season will surely make this feat an ordeal in itself. With the effort needed to reach the falls, it is highly recommended that a separate day be set aside to visiting Mag-Aso Falls. That will definitely give you more time to explore and appreciate the worthwhile trip. It is especially amazing to take the visit to Mag-Aso Falls when the weather is humid. The cool waters and green canopy will help neutralize the scorching heat from the sun. You will surely feel refreshed after a nice slow and long dip into the cascading cool waters of Mag-Aso Falls. 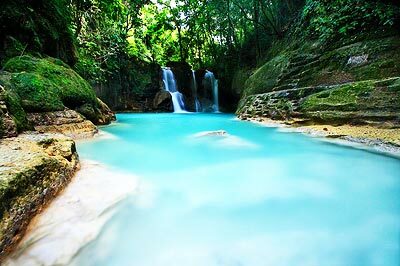 Book with us now and include your trip to Mag-aso Falls in your itinerary to visiting Bohol, Philippines. This would be an adventure surely not to be missed. Dumaluan Beach in Bohol, Philippines is the other beach of Panglao Island that has amazing powdery white sand and pristine turquoise water. 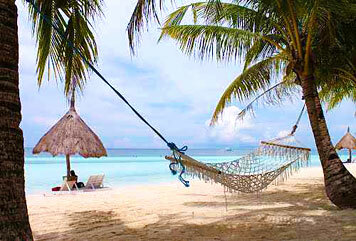 It is about half-hour car ride from Alona Beach and is at the southern and remote tip of Panglao Island in Bohol. Dumaluan Beach is 12 km from Tagbilaran City and about 6 km from Alona Beach. In contrast, Dumaluan is the quiet and more secluded beach than Alona Beach. Dumaluan Beach is well-maintained and not as crowded. If you want a perfect relaxation for your holiday, this is the beach to go for. It is more peaceful and the sand bar stretches far and wide. Some people think that Dumaluan Beach is far more beautiful than Alona Beach. However, there are fewer resorts and restaurants in this area and transport will be an issue. In Dumaluan Beach, there are areas for private use and is separate from the public. A guard post will mark the separation between the two areas. The public beach is not so crowded anyway there’s not much difference. However, if you want to use amenities from the nearby hotel that has the only private access to the private beach area, an admission fee is required. 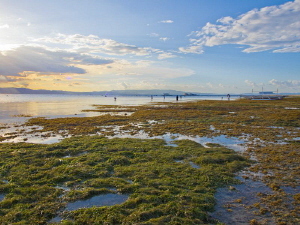 Dumaluan Beach is among the more gentle shorelines of Bohol especially in the summer time. There are plenty of shallow portions for kids to waddle in and playfully enjoy the water safely. Activities also include dolphin and whale watching at nearby Pamilacan Island and Balicasag Island, also in the area of Bohol, Philippines. Check schedule of pick-up in the mornings for water activities. Imagine yourself immersed in a fine and powdery texture of white sand, softly caressing the soles of your feet as you amble on the quiet shoreline dotted with palm trees viewing the panorama of the Bohol Sea. While you’re at it, get a peek at the underwater sea world of Dumaluan Beach, an area so rich in unique coral reefs and rock formations abundant with sea life. It is a perfect place to go snorkeling and scuba diving with your friends and family. Book now with us and experience this serene and beautiful white beach of Dumaluan in Panglao Island, Bohol, Philippines. Make your holiday with your family an unforgettable one. Bilar is a municipality of central Bohol with about 20,000 people and is located 40 Km from Tagbilaran, over an hour drive from scenic rural countryside. This area of Bohol, Philippines has always been dedicated to conservation of nature and resources. One of the projects is the Simply Butterflies Conservation Center that is home to about 150 species of butterflies. The tropical Philippines have diversity of butterflies and in Bohol alone, there are about 300 species. There is a clear evidence of decline on the population of these exotic creatures and the Simply Butterflies Conservation Center at Bilar, Bohol in Philippines has just done a marvelous job in keeping the butterfly population as stable as possible. This butterfly garden’s principle is to strengthen natural environment for the butterflies, plant research, breed and release into the wild. Without learning the rare butterfly’s host plants and catching them continuously, the end result will be a tremendous loss of its species in the area. Illegal poaching and deforestation are sadly, still expected. By educating the people and sharing knowledge of how to breed butterflies, the center has built a community of paid breeders in an area with serious lack of employment and income. These breeders work together with the center to ensure butterflies used at the center or the butterfly products that are exported from the island are made from sustainable hand bred sources, not captured from the wild causing damage to the butterfly population. The center also increases the Bilar, Bohol area’s butterfly population by releasing a calculated large number of hand bred butterflies into the wild, only using the surplus for making products to sell. 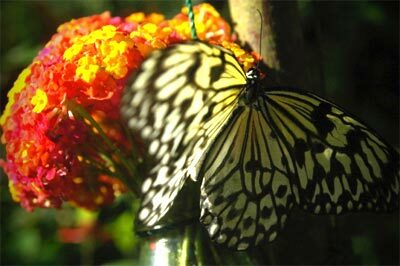 Visit and come face-to-face with hundreds of exotic beautiful butterflies fluttering around tropical foliage and flowers. Sit and relax, or take a stroll in this garden at Simply Butterflies Conservation Center in Bilar, Bohol Philippines. There will be knowledgeable guides to amuse everyone. 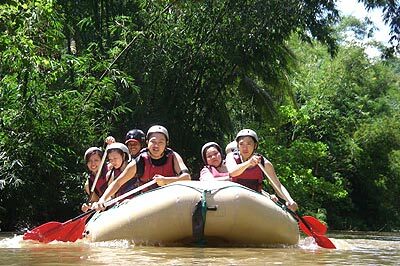 Book with us now and do not miss this wonderful activity for the whole family while you are here in Bohol, Philippines. Danao is a 2-Hour drive, 92 km north-east of Tagbilaran City. It is located amidst a large expanse of mountain ranges cut by the majestic river, Wahig River. The local government of Danao has launched this Tourism project called the Extreme Adventure Tour or E.A.T. Danao Adventure Park. This park is now a place for extreme activities while preserving nature promoting all the eco sports. For those seeking a thrilling experience, this is the place to go in Bohol. The most thrilling activity in the Danao Adventure Park is the canyon swing which is called the Plunge. It’s a 50-meter free fall from the top of the 200-meter high cliff. Then as you hit the end of the rope, you’ll be swinging over the canyon for about 5 minutes until they are able to haul you back up again; while the Sui-slide is the local version for Zipline, a sky ride or a slide for life. Sui-slide is coined from the word, “suis,” the swoosh sound that the cable makes while sliding to the other side. It could also mean for some, a suicidal slide due to their fear of heights. The riders traverse into the edge and slides through the cable for a half kilometer from one mountain to another, just about a minute ride. There is also wall climbing, a bracing climbing adventure using a 7.20m x 2.40m artificial wall with fiber glass holds or grips for hands and feet. With three (3) different boards, one can choose to climb on an Easy, Moderate and Extreme wall. With a climbing gear, a belayer and a master jumper, climbers have all the convenience to hit the highest point. Some other common activities to do in the river are tubing and kayaking. And around the river, one can do some cliff rappelling, root climbing, bouldering and spelunking. Trekking, mountain biking, visiting an organic farm, riding the cable car, buggy rides, swimming, fishing and camping are some of the activities that are more family friendly. Enjoy nature here at Danao, Bohol. Plan your trip for this exciting and extreme eco-adventure. Book with us now.